Gutters don’t have to be boring. It’s true that most homes in the U.S. are equipped with the same drab style of aluminum gutters. The angular shape and neutral color of these gutters are about as visually stimulating as a beige wall or a shag carpet. But what if you want something a little different—and stylish—for your home’s gutters? Then you should consider going with half-round gutters. Just like the name implies, half-round gutters look like you took a fully-enclosed pipe and cut it in half lengthwise. A “true” half-round gutter section has curled-top outer edges on both sides, although you can purchase these types of gutters where the outer edge has a curled top on only one side. Like traditional K-style” gutters, half-round gutters are available in different widths and colors, and can be purchased in sections or installed as a seamless gutter. 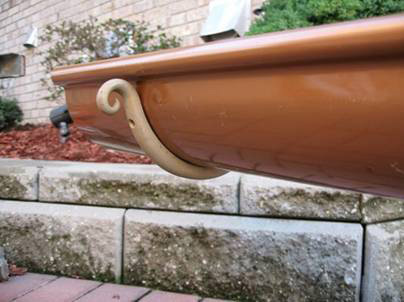 Half-round gutters were historically preferred on homes because they were easy to create using basic tools. Manufacturers just bended steel plates around cylinders, or even hollowed out raw tree stems. Today, half-round gutters are known for their availability in a wide range of materials—from aluminum and copper to galvanized and zinc-coated metal. 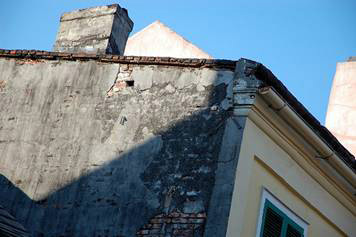 Because of the prevalence of older buildings in Europe, half-round gutters are popular because they match the style of the period in which those structures were built. Conversely, half-round gutters are not as widely accepted among builders and homeowners in the United States. 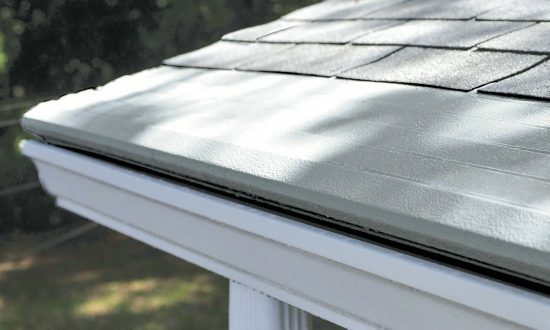 The K-style gutter came into fashion as a complement to more modern homes because of its resemblance to interior crown molding. As a result, K-style gutters became the industry standard and manufacturers have tailored their gutter manufacturing facilities to create those types of products. So if you’re looking for companies that sell and/or install half-round gutters, you’ll find that they aren’t as plentiful as those who deal with K-style gutters. That said, half-round gutters can really add a dash of flair to the right home. If your home was built in the early to mid-20th century, the exterior may be better suited to the half-round design. In addition, half-round gutters are ideal for the rounded rooflines which can be found in certain styles of architecture. Half-round gutters also hold a few advantages over their K-style counterparts. The major difference is that the inner shape of half-round gutters is smoother than the angularly-formed K-style gutter. This smoothness reduces the likelihood of corrosion, since there are fewer areas where wetness can form. In addition, their smooth surface allows waterborne debris to flow more freely instead of getting caught on rough edges or sides, which can lead to clogs over time. Given this fact, it’s easy to see why half-round gutters are easier to clean than K-style gutters. However, you should be aware of the drawbacks of half-round gutters before installing them on your home. In most cases, half-round gutters are more expensive—not only due to their reduced availability in the marketplace, but also because they require special threaded rods and hanger brackets to put them up. Furthermore, the volume of water that a half-round gutter can hold is less than a K-style gutter of similar width, which may be an issue in areas with substantial rainfall. Finally, half-round gutters tend to be heavier than standard gutters because their shape requires more material to support the same amount of weight as a comparably-sized K-style gutter. Are Half-Round Gutters for You? If you are strongly considering half-round gutters for your home, be sure to locate a contractor who has experience in hanging that specific product; don’t settle for a company who has only installed K-style gutter systems. Also, be aware that you may have to shop around for the exact style, material, and color you’re looking for. And as previously stated, be prepared to pay more for gutter installation than you would if you were settling for standard gutters. But once your half-round gutters are mounted on your home’s roofline, you’ll be impressed with the extra panache and increased curb appeal they provide.